Toxic chemicals don't belong in menstrual care products. Period. Unfortunately, our research shows that many of today’s menstrual and vaginal care products contain a host of chemicals that may cause cancer, disrupt hormones, or cause unnecessary allergic reactions. 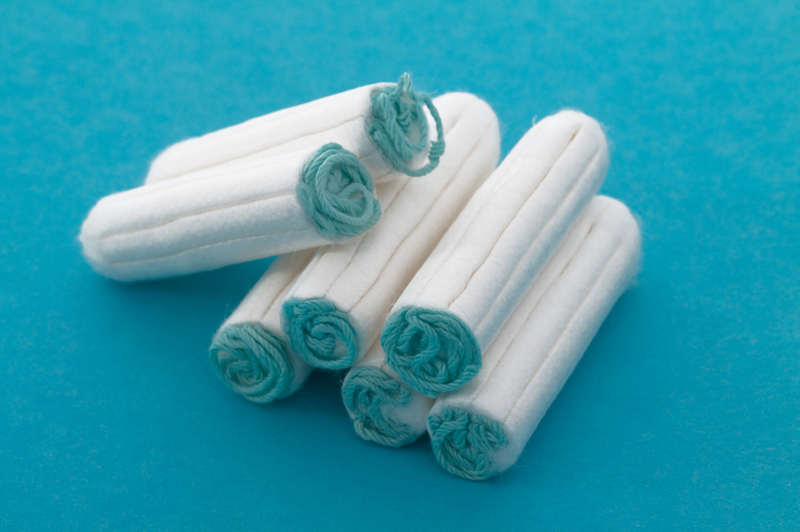 Tampons are used by up to 70 percent of menstruating women in the U.S. Other products such as douches, sprays, washes, and wipes, are used by 20-50% of women, with use rates considerably higher among African-American, Latina and low-income women. The Food and Drug Administration does not require companies to test for all harmful chemicals, nor do they require companies to disclose the presence of all chemicals used in these products. 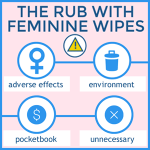 Given the widespread use of these products, the particularly sensitive exposure route for women, and the lack of regulatory oversight, Women’s Voices for the Earth is working to eliminate toxic chemicals from the $3 billion U.S. period and ‘feminine care’ products market. 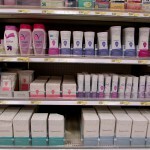 The bottom line: Toxic chemicals don’t belong in personal care products. Period. 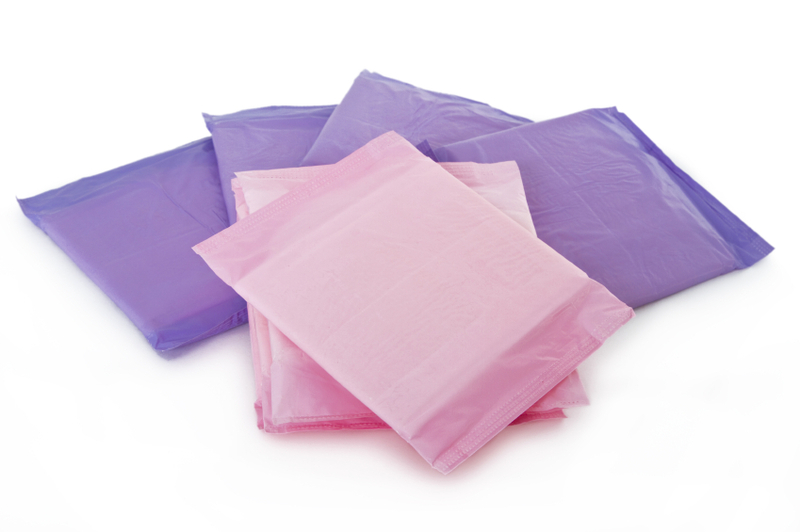 Reduce your exposure to toxic chemicals in period and personal care products. In depth reports on the chemicals of concern found in menstrual products. 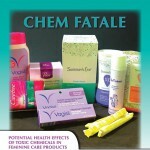 Print our Chemicals of Concern fact sheet and take it with you when shopping for ‘feminine care’ products. 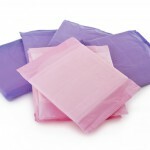 Reduce your use of ‘feminine cleansing’ products. 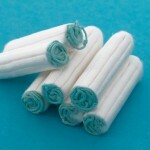 Choose chlorine-free bleached or unbleached cotton tampons and pads. If you are having allergic symptoms, switch brands! When you do switch – call the company’s 1-800 customer service to tell them why! Tell the FDA if you’ve had symptoms that may be from a period or personal care product. 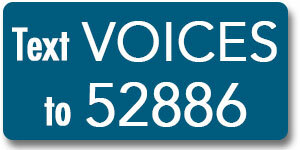 Call 1-800-332-1088 or fill out a consumer reporting form. Nanosilver (minute silver particles) is commonly incorporated into athletic clothing to make it “antibacterial” in an effort to reduce odor. In recent years, it has also been unnecessarily incorporated into certain period products including menstrual underwear, and some menstrual pads. Unfortunately, there are concerns about the effects of this antibacterial agent has on vaginal and vulvar tissue. Learn more. 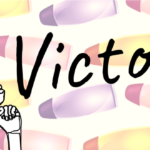 In April 2018, we sent six popular brands of U.S. tampons to a lab to see what we could find out. We tested for volatile organic compounds – a suite of over 100 toxic air pollutants that can be tested for simultaneously. We discovered that for some brands – there appears to be more complexity (and chemical emissions) than others. Learn more. Over 65% of women in the United States report using some form of vaginal lubricant in the previous month. While they can be very effective at reducing discomfort at the time they are used, researchers are becoming increasingly concerned about the potential longer term health effects of exposure to these products. Through claims of “freshness,” “confident clean” and yes, even “odor control,” wipes are being advertised as the better option for the health and happiness of women. 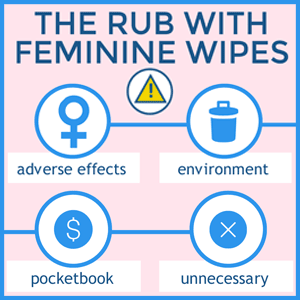 But the truth is, wipes may be doing you (and the planet) more harm than good. 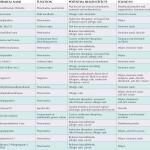 Colorants found in some feminine washes come in contact with vaginal mucous membranes –violating the FDA’s use restrictions, and may adversely affect the health of women using these products. Whether you use vaginal douching products or not, this important first-of-its-kind study reaffirms the need for more research into this unique and sensitive route of exposure for women. 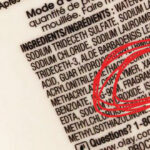 This list includes chemicals of concern that are discussed in our Chem Fatale report. Download & print this list and leave it in your purse or bag to refer to when you’re shopping for ‘feminine care’ products. a serious message: Detox the Box!